Although the interview was over at the time Moyes made his remark, the camera was still running and footage of the incident was published three weeks later by a national newspaper. Moyes was contrite about the incident when questioned at a subsequent press conference. I was disappointed with myself for it. 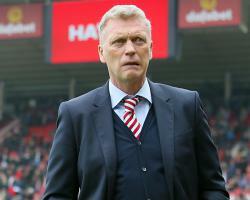 The club described Moyes' conduct as ''wholly unacceptable'' but stood by him as he attempted - in vain - to preserve Sunderland's Premier League status. Moyes denied the charge but the FA's independent regulatory commission upheld it. An FA statement read: "David Moyes has been fined Â£30,000 in relation to comments he made after the Sunderland versus Burnley game on March 18, 2017. "It was alleged his remarks were improper and/or threatening and/or brought the game into disrepute, contrary to FA rule E3(1). "He denied the charge, however it was found proven following an independent regulatory commission hearing." Moyes resigned from his role at the Stadium of Light on May 22 following Sunderland's relegation.